At some point in your speaking career, you may be asked to speak in tribute to someone special or important--an honoree or nominee, perhaps. That's happening all over Hollywood this awards season. Many of the tribute speeches fall flat with me, too torturously scripted and full of platitudes. Not so Meryl Streep's tribute to Emma Thompson, star of this season's Saving Mr. Banks, a Disney film about Walt Disney's clashes with Mary Poppins author P.L. Travers. It took place at the National Board of Review awards gala, and it tackled two big speaking tasks--context and honor--in surprising and eloquent ways. And despite the fact that the gala was private and unrecorded, Streep's speech got immediate attention and buzz. Nobody can swashbuckle the quick-witted riposte like Emma Thompson. She's a writer. A real writer. And she has a writer's relish for the well-chosen word. But some of the most sublime moments in Saving Mr. Banks are completely wordless. They live in the transitions, where P.L. traverses from her public face to her private space. I'm talking about her relentlessness when she has her verbal dim sum, and then it moves to the relaxation of her brow, when she retreats into the past. It's her stillness. Her attentiveness to her younger self. Her perfect alive-ness. Her girlish alertness. These are qualities that Emma has, as a person. She has real access to her own tenderness, and it's one of the most disarming things about her. She works like a stevedore, she drinks like a bloke, and she's smart and crack and she can be withering in a smack-down of wits, but she leads with her heart. And she knows nothing is more funny than earnestness. Pay attention to mood and transition: Bringing up Walt Disney's less charming qualities was an accurate piece of context, given the film in question. But at an awards ceremony, it took a deft touch to ensure the mood of the room didn't sour. 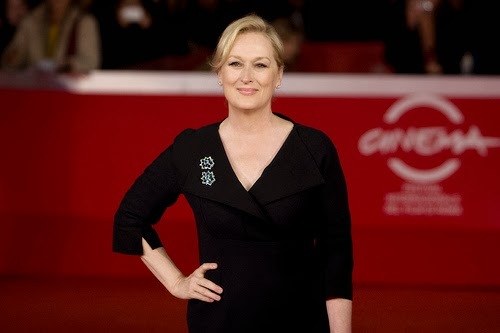 Streep used a smooth transition that applied to both of the difficult people she was describing: "But when we sit in our relative positions of importance and mutual suspicion, and we cast judgment on each other's work, we're bound to make small mistakes and misconstrue each other's motives." Then she moved right into her tribute. That transition ensured that this didn't sound like a diatribe, nor an over-praising of Travers, herself a tough nut to crack. Use detail for authenticity: Reading the brief rejection letter told the audience that Streep's statements about Disney weren't just matters of opinion, and added needed detail, briefly, to make her context both accurate and authentic. It added to her credibility, and spoke for itself. Keep your eye on the ball: The main focus of her remarks was Thompson, the honoree. Using the brief letter gave Streep plenty of time to pay tribute to Thompson--and the exquisite language she used in tribute made clear to the listeners that this was the key moment of her speech. There's no video of her speech at this exclusive event, but you can read the full text here. What do you think of this famous speech?